We all know that an accurate quarter inch seam is essential for having your quilts come out nicely. They help ensure that your points aren't missing and it makes lining up those corners soooo much easier. Every machine is different. 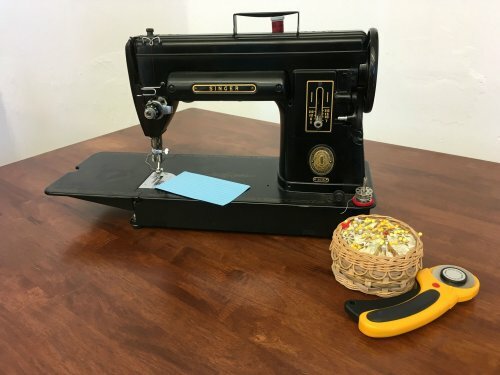 Some machines even come with a quarter inch quilting foot. Most of these are very accurate in their measurements. Their downfall is when you press your fabric too far into the foot. You'll end up with a bit of a bump right where the fabric meets the stopper guide. 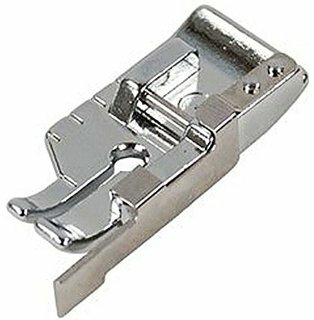 This makes your seams slightly bigger than a quarter inch. Many of us have machines that have markings on the machine bed. They're supposed to tell us exactly how big the seams are when we use them. As with everything in life, they may not always be completely accurate. 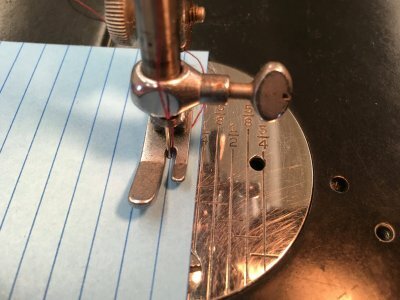 The absolute easiest way to check them is to use a very fancy, expensive, and exclusive quarter inch checking tool that Heather developed over years of quilting.... I kid. Your standard 3"x5" lined note card is the easiest and least expensive way. The cards have lines that are 1/4" apart. The very last line can be a bit above the bottom of the card. I tend to trim these off when checking so that I can line up my card with many different points on my machine. 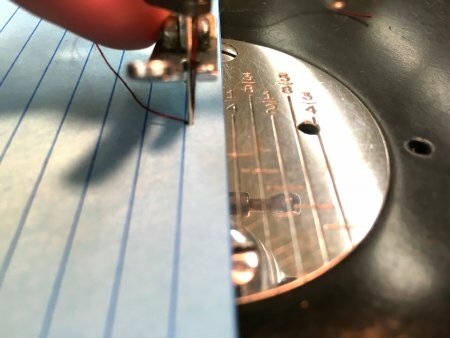 Once you've trimmed the card (with something other than your fancy fabric scissors, this is no time to lose that nice sharp edge on heavy paper! ), drop your needle on the last line and see where your card ends up. In my example I'm using an old Singer 301A. You can see that there are lines that tell me the various widths for my seams. You can also see that my card doesn't line up exactly with my quarter inch line. The card, unfortunately, doesn't line up with anything easy on my machine bed. My solution to this is to use painters tape. Line it up directly with the edge of the card and run it off the bed of the machine. Now you've got a long straight line to keep your fabric along! Another thing to consider is that many patterns call for a scant quarter inch. This is just a smidge smaller than a regular quarter inch. The reason for this is to take into account the fabric that is used up in the fold when you press your seams flat. To check for this, you should drop your needle just to the right of the line on you handy dandy 3"x5" card.